CleanMail offers complete email security - effective and easy to implement & use, with seamless integration into any existing e-mail environment. CleanMail Server protects Microsoft Exchange, IMail, Lotus Domino/Notes and any other mail server against all kinds of junk mail containing spam, viruses and phishing attacks. CleanMail Home can be used with any POP3 email client software to protect a single computer. CleanMail was designed to make the integration into existing e-mail environments simple and straight-forward. This is achieved by implementing the antispam filtering engine as a transparent SMTP/POP3 proxy server. CleanMail allows you to configure an unlimited number of SMTP or POP3 proxy ports (full multi-domain support). It can be installed on your existing mail server and does not require additional hardware. CleanMail provides a lot of different Mail Filtering Policies, which enables each customer to configure it exactly according to their respective corporate policies. Read more about CleanMail's Mail Filtering Policies. CleanMail's Filter Chain Architecture provides an open interface to extend its functionality by integrating third-party tools, e.g. for email classification and automated processing or for server-based email encryption. CleanMail comes with a complete one stop setup that installs one of the world's most advanced and thorough anti-spam & anti-virus filters on your server in a matter of minutes. It has an easy-to-use administration wizard. Have a look at some sample screenshots of CleanMail's Admin Wizard. CleanMail already provides a lot of different built-in mail filters to perform all kinds of checks and processing of incoming e-mails. CleanMail not only protects you against spam, virus and phishing mails, it also provides a built-in attachment blocker to filter out all kinds of malicious attachments. Read more about CleanMail's Attachment Filter. CleanMail already includes ClamWin Anti-Virus and additionally provides built-in support for all popular virus checkers to protect you against virus attacks. Read more about CleanMail's Anti-Virus Filter. CleanMail checks IP addresses of incoming emails against DNS blacklists containing known spam relay hosts. The DNSBL filter rejects all mail that has been relayed by a blacklisted host. Read more about CleanMail's DNSBL Filter. CleanMail's Fingerprint filter calculates message fingerprints (fuzzy hashes) and compares them against a database of known spam message fingerprints. If a message fingerprint matches a known spam message fingerprint, the mail is blocked. If a message is blocked by another filter, its fingerprints are automatically added to the database, speeding up the processing of similar spam messages. Read more about CleanMail's Fingerprint Filter. 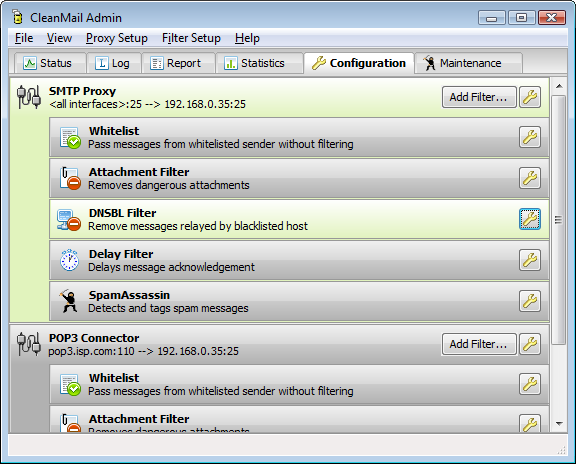 CleanMail Server can be configured to use a built-in delay filter to stop spammers from delivering junk mails to your server. Tests have shown that the Delay Filter itself already blocks up to 73% of all junk mails while causing only minimal resource usage on the host system. The effect of delay filtering is comparable to greylisting, but delay filtering of course avoids the common drawbacks of greylisting. Read more about CleanMail's Delay Filter. Read more about CleanMail's SpamAssassin Filter. The SpamTrap filter automatically keeps the SpamAssassin filter up-to-date by training a Bayes database with incoming spam mails. Read more about CleanMail's SpamTrap Filter. CleanMail also protects your mail server against Directory Harvesting Attacks. Read more about CleanMail's Directory Harvesting Protection. 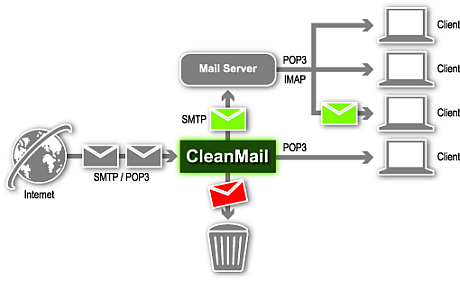 CleanMail prevents that your SMTP server becomes an open relay. Read more about CleanMail's Open Relay Protection. 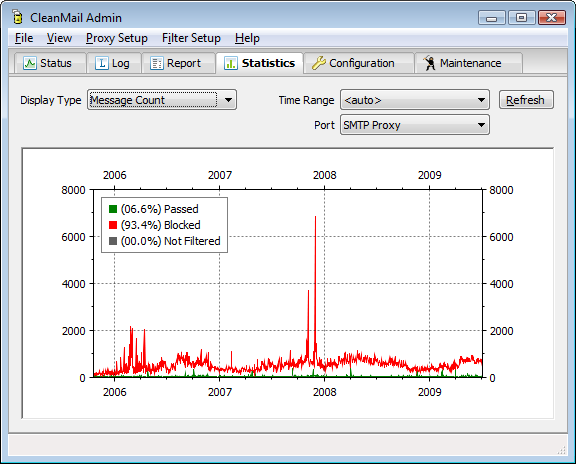 CleanMail also offers protection against mail flooding caused e.g by non-delivery reports. Read more about CleanMail's Mail Flooding Protection. CleanMail's Mail Storage filter can be used to automatically archive all inbound and outbound mails directly on the server without any user interaction. Read more about CleanMail's Mail Storage. The extensive reporting, statistics and logging facilities of CleanMail provide the system administrator with up-to-date status information of all kinds including realtime charts as well as statistical data. Read more about CleanMail's Reporting, Statistics and Logging Facilities. For a detailed description of all CleanMail features, please see the CleanMail Server User Manual. For personal, non-commercial use, have a look at the CleanMail Server freeware license. For commercial use, please check the licensing options, offering exceptional value at reasonable prices. Compare CleanMail to other email security solutions, and judge for yourself! Download the free trial version and see how easy it is to set up CleanMail.